When I was six, I was given a book called The Children’s Encyclopedia of Prehistoric Life. This, as far as I recall, is the single trigger for my interest in dinosaurs – if my mind did work like Inside Out, this would have been when a core memory slid into place to create Dinosaur Island. The book was divided into three sections: the first covering dinosaurs and the creatures that came before them, the second covering the Age of Mammals, and the third covering the ancestors of modern humans. Most of the contents were completely new to me, and really fired my imagination: fish that could walk on land, rhinos the size of houses, animals unlike anything that existed in the present – and of course, the dinosaurs. I was so inspired that I made three little picture books with my own illustrations, based on those in the book: it was soon after that when I first tried writing my own stories. 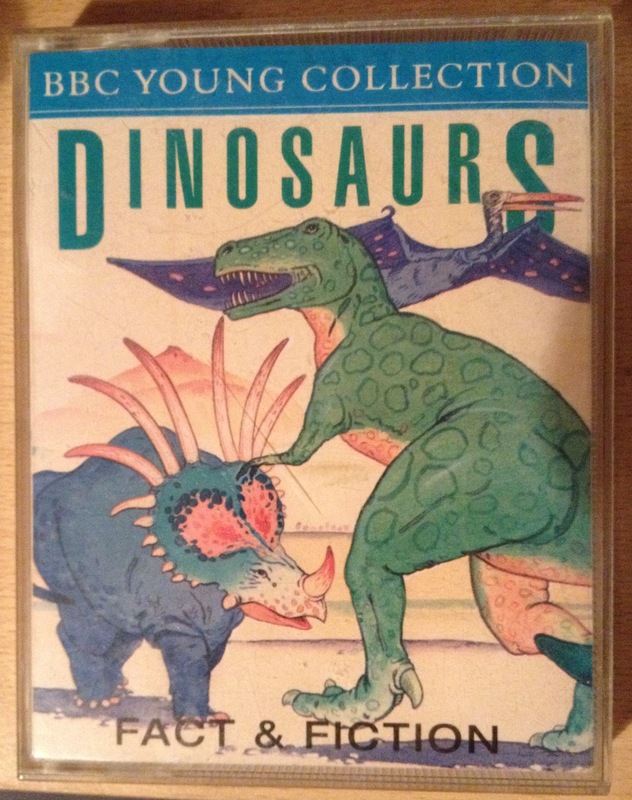 For the rest of my primary school years, I was a big dinosaur nerd, and there were a number of different outlets – besides books, of which I gained plenty – via which a young boy could quench his palaeontological thirst. So I thought I’d share some of my favourites from the time, things I enjoyed over and over again, and see if anyone else remembers them! This computer game was part of a series called Knowledge Adventure, of which the only other game I got to play was Speed. 3D Dinosaur Adventure came with an encyclopedia section, which was where I first learned that I had been mispronouncing many of the names in my Children’s Encyclopedia: Coelophysis as ‘Ko-low-fie-sis’, for example. There was also a variety of musical tracks which fit each article very well: ominous and dangerous for theropods, towering and majestic for sauropods, etc. Outside the encyclopedia were a number of relatively simple games, like being presented with a dinosaur name and clicking on the correct picture out of four, or selecting the correct dinosaur when shown a close-up of its body. There was also a movie theatre with many different clips – many of which came from the 1985 documentary Dinosaur! – and a game called Save The Dinosaurs. This involved navigating a maze to reach Triassic, Jurassic and Cretaceous zones and “rescue” various dinosaur species – by reaching and clicking on rough 2D images of said dinosaurs, dodging giant insects and Dromaeosaurus on the way – before a comet could hit the Earth and wipe them out. The graphics weren’t that great, but that was hardly a consideration back then; and while the games were very simplistic, I was always more interested in the encyclopedia anyway. This documentary was originally made in 1982, but I first encountered it many years later in the form of a VHS tape which I watched over and over again. While very informative – listing a wide range of dinosaur species, and giving plenty of anecdotes about early fossil hunters – it also kept things very simple and child-friendly. It featured an inflatable crocodile named Dil playing host alongside the human narrator; it had several musical numbers, some of which are very difficult to get out of your head; and it ended with Dil hosting a quiz show between three dinosaurs and a Welsh dragon. Pictured above, this was actually two separate audio productions on two cassette tapes. The first is like a radio play, where wildlife presenter Michaela Strachan (whom I already recognised from the Really Wild Show at this point) and her “Gramps” go on a virtual reality dinosaur safari through the Triassic, Jurassic and Cretaceous: the sound effects and descriptions made this very immersive, while Gramps’s grouching provided a lot of comedy. The second tape is a reading of Gerald Durrell’s story The Fantastic Dinosaur Adventure, narrated skillfully by Brian Blessed. In the story, three children and their great-uncle go back in time – again, through the old Triassic-Jurassic-Cretaceous route – to stop an evil game hunter who stole the great-uncle’s original time machine and now plans to capture baby dinosaurs to sell in the present day. Involving not just time travel, but “magic powder” which allows the people to talk to dinosaurs, it’s hard to think of a more fulfilling children’s fantasy. Dorling Kindersley’s Eyewitness series took the form of a number of informative books, short documentaries, and video games. Dinosaur Hunter was particularly appealing to me as by the time I received it (in 1997 or 1998), I had been into dinosaurs long enough to realise that new discoveries were constantly changing the big picture, and much of what I had originally learned was out of date. Tyrannosaurus rex was no longer the biggest land predator of all time, displaced by Giganotosaurus (which would in turn be displaced by Spinosaurus in years to come), and traditional classifications had been revised too. Dinosaur Hunter had the latest information, plus computer graphics had come a long way since 3D Dinosaur Adventure. Like other Eyewitness Virtual Reality games, the setting was a three-dimensional museum. Around the outside was a Mesozoic timeline where profiles for different dinosaur species could be found. The central room featured a huge Tyrannosaurus and Triceratops, and a number of exhibits on such things as anatomy and behaviour. A few minigames were scattered throughout, but the big one was the Dinosaur Excavation Site, which required you to collect bones from six different dinosaur species – Tyrannosaurus, Triceratops, Edmontonia, Heterodontosaurus, Herrerasaurus and Dilophosaurus – and fit them into the appropriate places on the skeleton. Once this was done, the dinosaur in question would come to life, and could be found wandering around the museum at various points until you reburied the bones to start the game again. Dinosaur Hunter was both fun and fascinating – though is, of course, now rather out of date itself. This Orbis magazine was originally printed for 104 issues starting in 1992, at which point I managed to pick up an issue here and there. However, the series was re-printed a few years later, though only up to Issue 78, and I was able to build a more complete collection. I was also able to build the Tyrannosaurus and Stegosaurus skeletons, who came piece-by-piece in the first two-dozen issues, though the flimsy Stegosaurus has since fallen apart. Each issue would begin with fact files for three dinosaurs, before moving on to broader (though still simplified) articles. There would also be a two-page spread of one of the featured dinosaurs (these magazines had some great artwork), some 3D images (you would get 3D glasses in the first issue), and a Q & A with palaeontologist Dr David Norman. One of my favourite parts of each issue was a comic strip which started out telling stories of important dinosaur discoveries and the palaeontologists behind them, but later expanded to day-in-the-life episodes for various dinosaurs. The magazine as a whole eventually expanded by giving focus to other prehistoric animals, both before and after dinosaurs. So did you know and enjoy any of these? Feel free to comment if you did! This entry was posted in My Thoughts and tagged 3D Dinosaur Adventure, dinosaurs, Dinosaurs: Fun Fact and Fantasy, Eyewitness Virtual Reality Dinosaur Hunter. Bookmark the permalink. I remember Fun Fact and Fantasy and the Eyewitness docs narrated by Andrew Sachs. The VHS’ ended up very worn! I really liked those Eyewitness videos as well!